I know in my personal gaming history, scrolls were nearly always spell scrolls. Even though over a third of random scrolls results in BX (using the Cook table) are protection scrolls, I don't think one of these ever came up when I was younger. 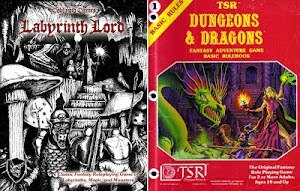 After coming back to the fold via Labyrinth Lord years ago, I've placed them deliberately now and then, but I don't remember one getting used in play. 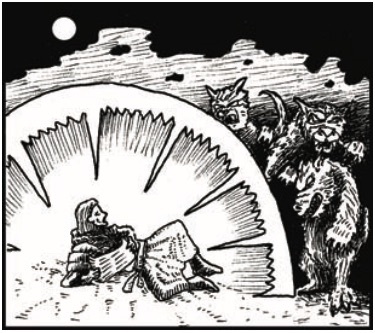 No one in the circle tries to attack the lycanthropes in melee (breaks the enchantment). Now the interesting thing about that is the "in melee" part. Moldvay specifies "hand to hand." That could be interpreted as spells and missile fire being OK. If so, that makes that Protect from Undead scroll very nice indeed, as it seems undead are much more common than weres in most games (especially lower levels). The really interesting one is the Protection from Magic scroll. No spells or magical effects (items, etc.) in or out. Now this one lasts 1d4 turns, but there is no caveat about attacks ending the effect. Probably because it isn't a ward vs. a particular type of creature. This seems like a good way to try to hamstring that evil wizard: Get close enough, read the scroll, then stay on him so he can't get clear of the "dead zone." Now, the PCs' items and stuff are also nullified, but a 10th level fighter with a regular sword is way scarier than some unarmored guy in a funny hat. I'm really enjoying your B/X analysis. I'm deep into the first fully B/X campaign I've run in years. Keep up the good work! Thanks, I continue to be amazed at how much hides inside this game.